If you’re trying to lose weight or stave off chronic conditions like diabetes and heart disease, it’s not only the type of food that’s important — it’s also how much is consumed and when. 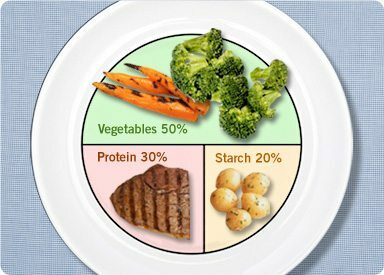 Learn to gauge the portion size correctly so you know how many calories and carbohydrates you’re taking in. Learning what a portion size actually is and consuming that amount, however, is tricky. People are notoriously bad at estimating what, say, a cup of breakfast cereal looks like — particularly in a world where cereal bowls are now as big as serving platters. But it’s a battle worth fighting. In a 2004 study of 329 overweight patients, researchers at Summa Health System in Akron, Ohio, found that 38% of those who practiced portion control for two years lost 5% or more of body weight, while 33% of participants who did not practice portion control gained 5% or more of body weight. There are several things you can do to get started. Eat in a consistent manner. If you’re starving, you’re more likely to eat an extra-large portion. For most people the best meal plan is probably three well-designed meals and one snack. You should eat a minimum of three times a day, avoiding going longer than five hours without eating. You don’t need to get up in the middle of the night, but don’t skip meals, say dietitians. Use “rule of thumb” measures. Knowing that 3 ounces of lean meat is equivalent to a deck of cards and 1 cup of breakfast cereal is about the size of a fist is crucial, particularly when you need to choose quickly. Know the difference between a serving size and a portion size. Serving sizes are listed on nutritional content labels. For example, a small bag of pretzels may indicate that it contains two serving sizes, so if your portion size is the whole bag, you’d have to double the calorie, fat, and carbohydrate information per serving to know how much you’ve taken in. Try to eat three bites, not the entire thing. Splitting dessert with a friend is ideal. Develop good “eating out” habits. Fill up your plate with green veggies, and get full on those before eating other food. When ordering a meal, ask the server to only put half the meal on your plate and to pack the other half to go. Keep in mind that restaurants specialize in mega-portions; a 12-ounce steak can contain three to four servings of meat (two to three servings a day are recommended). Have a plan for what you want to eat, including snacks. Write down what you eat, think before you eat, and eat slowly. Snacks should typically contain no more than 100 calories and 15 grams of carbohydrate. Some good choices include three cups of plain popcorn, 17 small grapes, a 6-ounce container of artificially-sweetened yogurt, 15 mini pretzels, or a tennis-ball size piece of fruit.